Mixed results over the weekend by most anglers but some very positive feedback on Tongariro fish coming from anglers who fished under the main road bridge. I was out on the river with some clients yesterday andÂ passed over the bridge about 9am and witnessedÂ two guys out of 7 landing fish and 2 guys crossing the bridge with killed fish which were caught earlier.Â This pool amazes me on why so many fish hold in here and why so many fish get caught here during all hours of theÂ day with the same glo bug rig in bright conditions. Speaking with Ross during the week he mentioned a worthy comment ” maybe they are scared to go under the bridge during the day with bright conditions Â as they have never seen such a thing and hold back until the cover of darkness” maybe? On my way home yesterday afternoon I stopped once again and had a quick look over the top and saw maybe 20 fish swimming back and forth avoiding the net of nylon being flung in there. If they are in the bridge pool they must be above and below the bloody bridge just a little bit more spread out I suspect. Anglers in the rest of the river enjoyed the lovely Turangi weather and caught fish in various pools with early starts and moving through as many pools as you can. I think the key at the moment is to move about, start early and use small natural patterns. I picked up a few rocks yesterday in the Hydro and found really good numbers of Caddis taking cover in the thin slime that most of the larger rocks now have. Trout love these and as we go into summer they will be a key food source for both recovering trout and fresh trout entering the river. There isÂ a myth that spawning trout don’t eat while they are in the river just the same asÂ spawning salmon but if this was the case surely we would’nt catch any???? The braids during the week has produced fish most mornings and indeed throughout the afternoon once the pressure has dropped off, again using small glo bugs as the sun hits the water before switching to small naturals such as Rubber legs and Caddis. The upper river has again taken votes for scenery but in my opinion there does not seem to be all that many trout holding in pools past Boulder Reach.InÂ saying that some anglers found the odd silver fish in the Blue Pool and surrounding runs and riffles.Â With the sunny conditions we have been having I could not think of a nicer place than the Sand pool it has to be one of the best scenic poolsÂ in the Taupo fishery. 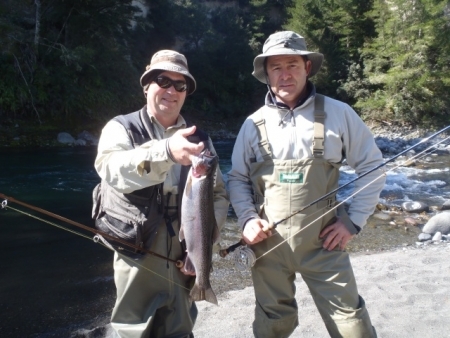 I guided Andre, Tim and Stephen yesterday for a quick half day and was able to enjoy at times most of the upper river as it seems most anglers are down low. Andre isÂ a very experienced angler andÂ spends time on the river for the scenery factor so we spent all day up high.Â Andre and Stephen were fairly certain they did not want to join the croud under a bridge which is crowded, covered in local art and noisy with traffic just to catch a trout which is understandable. The morning could not have panned out better with Andre landing two nice fresh hens from the far side wall of the Sand pool while using a heap of weight and a small rubber leg flashback. What a lovely place to have to yourself and land two good conditioned fish, things don’t get any better.Â In my opinion the SandÂ Pool has become better over the winter months and can now be accessed easier than in the past. 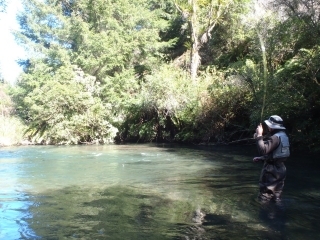 Crossing the tail may be a little hard as it has become deeper and this is one place you don’t want to loose your footing but if you can get far enough out on the sand (hip deep) and hit the far side with a nymphing rig assisted with split shot you will be in the zone of where trout having been holding. As for the rest of the upper river we found it quite barren which makes you wonder where all those trout are after they have been under the bridge all week. In many cases once they hit the middle reaches of the river they are fairly picked over, spread out and will soon start to move a bit quicker to get up the river to suitable spawning beds which in most cases seem to be past the fence pool. All these factors allow fish to escape the fisherman which in my opinion is a good thing, they deserve it if they can get past the Bridge pool! 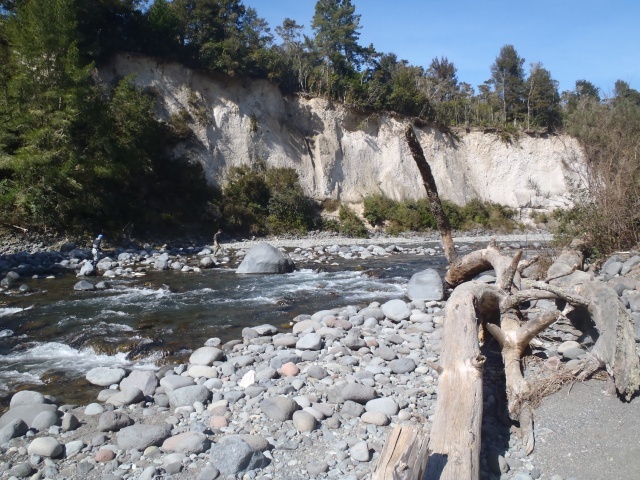 Still a little bit of rain forecast for the next day or so but it has again been down graded which probably wont be enough to alter levels of our rivers in Taupo. Have a good week and hope to hear from you soon.